No matter what your feelings are on Starbucks' Pumpkin Spice Latte season, it's tough not to get swept up in the hype. After all, the famously sweet and spicy flavor has found its way onto everything from french fries, to donuts, to craft beer, and even deodorant. And now, so as not to be left out, the folks at Anheuser-Busch have tapped into the craze, and have temporarily rebranded Busch Light as "Busch Latte." 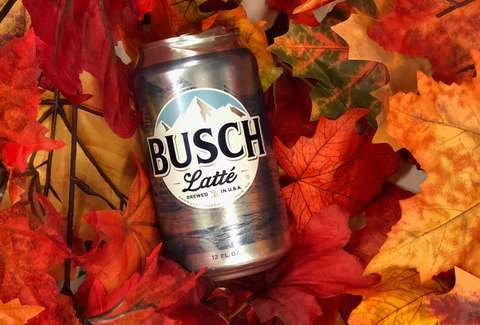 On Tuesday, the day the actual Pumpkin Spice Latte officially returned to the Starbucks menu, Busch unveiled its comical send-up of the exceedingly "basic" beverage and debuted its new look on Twitter, sharing a photo of a beer can rocking its new "Busch Latte" logo. Unfortunately though, if you were hoping to hit the grocery store to pick up a six-pack of the seasonally appropriate suds, there's a slight problem: it's not real. The rebranded cans are just a clever marketing stunt, albeit a fairly elaborate one. 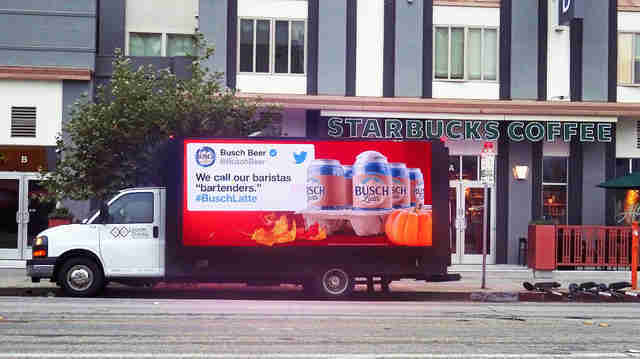 In addition to unveiling images of the mocked up Busch Latte cans, the beer brand has also debuted promotional billboards in Chicago, Los Angeles, New York, and St. Louis, where mobile billboards have also hit the streets (they've evidently been trolling Starbucks by parking them outside different locations). And while you can't get your hands on any physical Busch Latte cans since they don't exist, you can snag some Busch Latte merch right now thanks to the folks at Rowdy Gentleman, who are selling hats and t-shirts emblazoned with the temporary new logo style. There are even some official coozies up for grabs. But where's the Busch Salted Caramel Mocha?